This hurts a lot of people. This hurts people on the SEO side. It hurts people who do social media. It hurts people who invest in actually building the content, and it hurts teams and executives and people who plan and strategize around what content marketing can and can't achieve and how it should work. You know, I really came to this because I think it's been something that's been bubbling up in the world of content and inbound marketing for a long time. But I was speaking to a number of startups yesterday afternoon here in Seattle. I was talking to them about how we at Moz produce blog posts, video content, like Whiteboard Friday, presentations, and webinars in all of these different mediums. I got this question, like, "Okay, it must be the case . . . how do you put out a blog post, Rand, that once you launch it, once people read it, they're actually going to go and buy from you?" I had this moment of, "Oh my God, this happens all the time." People think that the reason you're putting out content is so that someone will consume that content and be inspired from it to go and make a purchase. This is how the myth works. Step one, oh yeah, you know, ta-dak I created this amazing piece of content. Look, it's got lovely parallax scrolling, and responsive design, and beautiful graphics, and a lovely layout. Fantastic content. Wow. All right. People are going to download that. They're going to share it. They're going to love it. Step two, thankfully, people are thinking about this at least. All right, I'm going to go tweet and Facebook share and put it on Google+. I'm going to point a bunch of links to it. I'm going to put it on my LinkedIn account. I'll promote that content through all of these platforms. Then, look at these hordes of people right there. Not the most attractive horde. A little gangly. But, wow, that's really good. We should sign up for whatever these people are selling. They must be amazing, right? The visitors who experience the content, and then some percent of them, like oh maybe 2% are going to go and convert. This doesn't happen, does it? This is not actually how content marketing works. But it's how a lot of people invest in and think about content marketing. But it almost never happens. 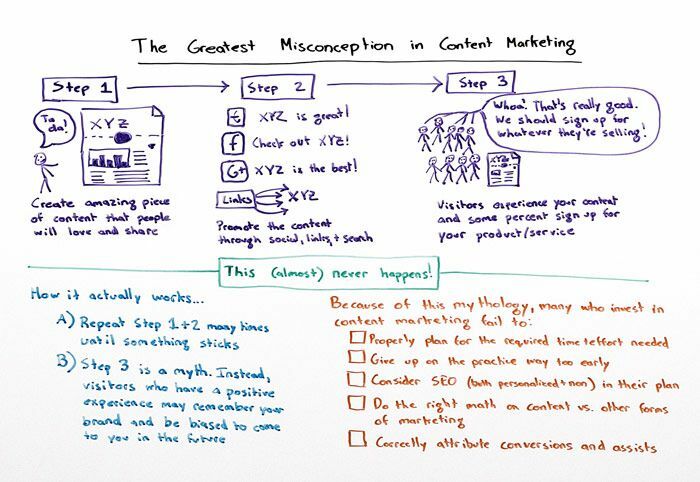 With a few rare exceptions, this is not how content marketing really works. Step three is entirely a myth. It is almost never the case, practically never the case that someone goes, experiences a piece of content from a brand they don't know about or haven't heard of, or experiences that content for the first time and then immediately goes, "I wonder what they sell. I should buy whatever that is." Or even sees kind of a plug or a pseudo-plug for their product inside that content and goes, "Yes, you know what, I'm just going to buy that right now." That almost never happens. What really does happen is that people come many, many times. They essentially grow this memory about your brand, about what you do, and they build up kind of what I'd call a positive bank account with you. But that bank account, there are not coins and money in there. There are experiences and touches with your brand. Those content touches, and those social media touches, and those touches that come through performing a search and seeing you listed there, those build up the capital in the account.